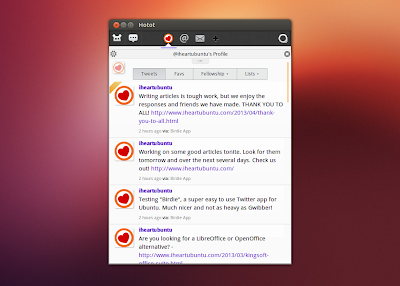 Hotot is a desktop client for Twitter (and Identica) and is open source and multi-platform. Run it on Ubuntu linux, Windows, Mac and Chrome. If you are getting tired of having 30+ tabs open in your web browser for various web based apps, something like Hotot might be just the app you’re looking for. We’ve done a few other Twitter client reviews in the past, but new ones come around which really trump the older ones. For example Hotot is much lighter than Gwibber. 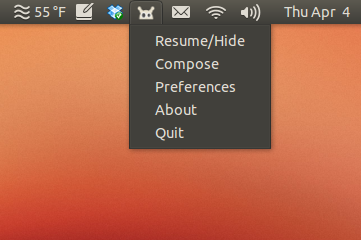 Hotot also has a nicer GUI (although thats opinion, but it is very nice). And who doesnt like the fact you can have multiple Twitter accounts stored in Hotot? Ive got my blog account, my personal account & my business account. While our example above only shows one column, you do have the ability to stretch Hotot and view 2 or 3 columns at once. There are a ton of other features too. Four themes are available including “New Hope”, “Classic”, “Iron Heart” and “Bare”. The default is “New Hope”, which you see above. You can also build your own themes. This should add the repository, update the rep list and install Hotot on your system.